Report at the dive center in Padang Bai by early morning. 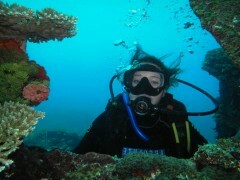 You'll meet your dive instructor and begin the training for your course. The day's agenda includes theory sessions and pool training. You'll begin by reviewing theory modules, watching training videos and taking short quizzes. Each modules is associated with a corresponding practical session in the swimming pool. 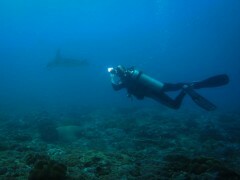 A certified dive instructor will get into the pool with you and teach you the use of scuba equipment like the snorkel, fin and regulator along with diving skills and techniques like buoyancy control. The day's session ends by late afternoon. You can spend the rest of the day at leisure. 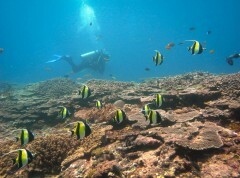 Learn the adventure sport of scuba diving in the dive sites of Padang Bai. Day 2 of the PADI Open Water Diver course in Padang Bai: 2 open water dives! Over the course of the day, you'll complete two open water dives. During these dives, you will continue practicing several breathing and navigation skills that you learnt in the swimming pool yesterday. Lunch is served on the boat between the two dives. The day's session ends as the boat returns back to the dive center by late afternoon. You can spend the rest of the day at leisure. Report at the dive center in Padang Bai by early morning. Depending on the dive instructor, you'll either travel to a few of the dive sites around Padang Bai or go diving near the USAT Liberty shipwreck. En route, your training continues as you focus on putting the finishing touches on your dive technique. Over the course of the day, you'll complete two open water dives, swimming down as deep as 60 feet. 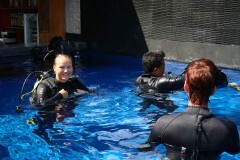 During these dives, you will work with your dive instructor to fine tune and perfect your scuba diving skills. Lunch is served on the boat between the two dives. The day's session ends as the boat returns back to the dive center by late afternoon. Your trip ends here.